The 13th Annual Go Red for Women Health Fair and Luncheon will be held Wednesday, March 9, at the Spokane Convention Center. Doors open at 9am, Health Expo starting at 10am, silent auction at 11am. Lunch and keynote speaker begins at noon. Get informed about the risks of heart disease and stroke. Know the red flags. Know your heart health story. Go Red For Women inspires women to make lifestyle changes, mobilize communities, and shape policies to save lives. This event will help to raise funds for research and community support, and to raise awareness for healthy lifestyles and healthy hearts. Don't miss this educational and life-changing community event. For tickets and more information, visit SpokaneGoRedLuncheon.heart.org or call 509-536-1500. 25 years ago, Jack Reber created a marketing tool that promoted the Inland Northwest's public golf courses to the tens of thousands of non-resident golfers who visited our region. That was years before most of this area's destination resort courses opened and tourists were beginning to discover our very reasonable greens fees. "The idea of the annual brochure and even the name, came to me as I was playing golf with a friend at MeadowWood Golf Course in the Spokane Valley. We were paired with two Canadian tourists," Reber said, "and they commented that with so many great golf courses at affordable rates, they wished that there was a tourist map showing the location of all the courses." The rest is history. 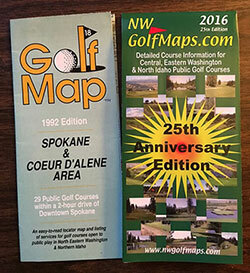 Over the past 25 years, just under 1.5 million NW GolfMaps have been distributed free to golfers at all area golf courses, visitor information centers and advertisers. Copies are available each spring as the courses open and throughout the tourist season. For more information, visit www.nwgolfmaps.com. Join Prime Real Estate Group on Saturday, February 27 for an evening celebrating local food and Providence Children's Hospital at this amazing piece of Spokane's history. This intimate dinner event will celebrate the Crommellin House at Sumner Avenue. This home established the neighborhood as the premiere location for luxury homes in Spokane and has been painstakingly restored by its owners, Cal and Amy Larson. The Larsons have remodeled and restored the house as a labor of love, focusing on the key features that set this home apart. Enjoy a four-course meal prepared by the Ivory Table with wine pairings and see first-hand this exquisite home, and help benefit a good cause. Doors open at 5:30 with a 6pm seating. For tickets, email events@propertybyprime.com or click here. The 38th Annual Spokane Home and Yard Show will be at the Spokane County Fair & Expo Center starting this Thursday, February 25 through Sunday, February 28. With over 225 exhibits, this year's show brings together hundreds of home improvement products and services in one location. Show hours are Thursday & Friday noon-8pm, Saturday 10am-7pm, and Sunday 10am-5pm. Admission is $7 for adults, good all weekend. Kids 12 and under free. Thursday is 2 for 1 day, two adult admissions for the price of one. For more information, visit CusterShows.com. On March 5, 1916, Harry A. Flood, president of Merchants Central Heating Company (now known as the Steam Plant), opened the valves to start operation - sending steam heat to Gus Pearson of the Stockholm Hotel and Pearsons Building on Main and Wall. Thus began the important role the Steam Plant plays in downtown Spokane. This year's centennial celebration marks that significant event in the Steam Plant's history. Its story is one of determination, grit and continual innovation - and it lives on today as one of Spokane's iconic landmarks. Steam Plant Centennial Celebration begins Friday, March 4, from 5-8pm with a First Friday exhibit featuring two local artists and their artistic interpretations of local icons and scenery. On Saturday, March 5 from 3-7pm, there will be a commemorative address by Steam Plant representatives and former employees, a short film of the Steam Plant's history will be presented and tours will be available. Live music featuring Roger Dines, Darin Hildebrand, and Devin Manskey begins at 4pm and the Steam Plant Brewing Co. will have beers and appetizers available. Both days are free and open to the public. Steam Plant Square is located at 159 S Lincoln. 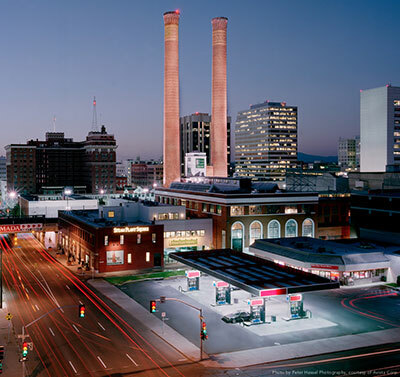 The Steam Plant created and supplied heat to more than 300 buildings in downtown Spokane from 1916 until 1986. Ten years later it was transformed into the Steam Plant Square, a mixed-use space that retained as much of the equipment and industrial materials as possible. The renovation efforts earned multiple awards, including first-of-its-kind recognition from the National Trust for Historic Preservation for historic buildings in our region. To learn more, visit steamplantspokane.com. Award Presented to Quality Inn Downtown 4th Ave. The Quality Inn Downtown 4th Ave has received a 2016 Gold hospitality award from Choice Hotels International. This award is presented annually to the top hotels within the Quality Inn brand based on various factors including guest satisfaction ratings. This is the second year in a row that this hotel has won this prestigious award. Kalispel Golf and Country Club has assembled the region's top golf and culinary professionals to launch the most historic course in the Inland Northwest. For a limited time, the Club is accepting new membership. With just a few weeks left until the golf season opens, a full remodel of the Clubhouse is underway. The Tribe will soon unveil the 1898 Public House. Paying tribute to the year the historic Club was founded, the restaurant will combine a storied history with modern flair, featuring classic foods with a fresh twist. Led by Executive Chef Tyler Schwenk, formerly of Beverley's at the Coeur D'Alene Resort, dining at 1898 will be available to the public beginning in mid-April. For more information about membership at Kalispel Golf & Country Club, visit www.kalispelgolf.com or contact Les Blakley at lblakley@kalispelgolf.com. Chad Haverkamp, who has over 10 years of experience in banking, has joined Mountain West Bank as a commercial lender in Spokane Valley.